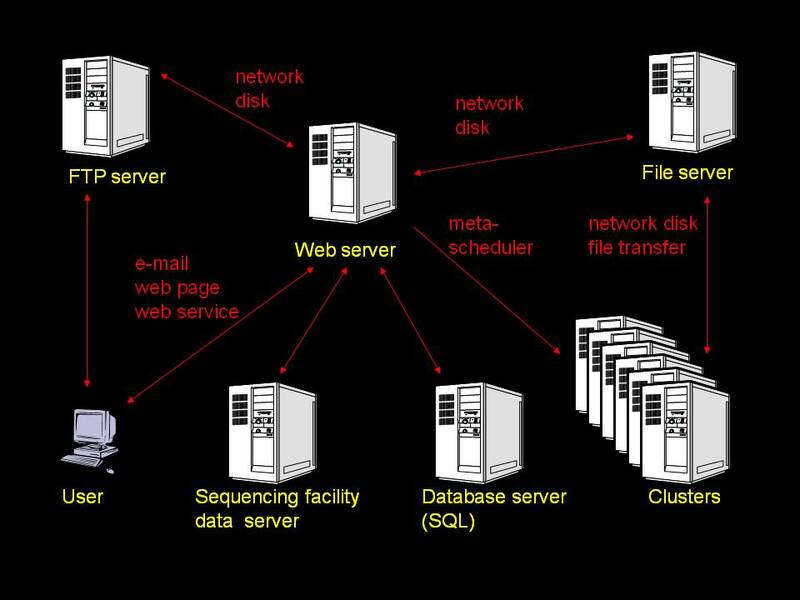 The system consists of a web server running the interface (ASP.NET C#), Microsoft SQL server (ADO.NET), compute clusters running Microsoft Windows, ftp server and file server. Two local compute cluster schedulers are supported (CCS and HPC Server 2008), remote clusters can be used via JSDL/HPC Basic Profile. Users interact with their jobs and data primarily by a web browser and e-mail. Jobs are submitted through our active web pages, fully compatible with all the popular web browsers supporting DOM and Javascipt. Notification e-mails sent to users upon job submission, start, and completion contain links for job progress monitoring, job cancellation and restart, and results retrieval (by http or ftp). Job and data control functions can also be performed via a recently developed web service interface which enables users to build custom clients independent of the web browser. The number of applications offered through the web service (currently 10) is growing. Users can interact with their jobs and data by a web browser, ftp or e-mail. The jobs are currently submitted through BioHPC active server web pages, users are provided with links for job progress monitoring. When a job is finished an e-mail with link to final results (by http or ftp) is sent. The jobs can be cancelled, stopped and restarted by users through a set of urls provided at the time of submission. The interface has also a built in user management system which can limit software and/or database access to specified users. Data access between different users is restricted – users can access only their own jobs and data, even when working as guests. There is also administrative interface allowing for easy management of jobs, users, applications with automatic e-mail notification of possible problems. MS Windows HPC Server 2008 is supported on all x64 hardware platforms. MS MPI is used for parallel communication. MS Windows Compute Cluster Server 2003 is supported on all x64 hardware platforms. This is an older version of Microsoft HPC platform. MS MPI is used for parallel communication. Web server is required, but it does not need to be a separate machine. It can be installed on head node. The interface is written in C# on ASP.NET platform. It is fully compatible with all popular web browsers supporting DOM and Javascipt. CBSU web server is running MS Windows Server 2003, but MS Windows Server 2008 is also supported. Windows SDK and .NET 3.5 are required. File server is required, but it does not need to be a separate machine. It can be installed on cluster head node or on web server. SQL server is required, but it does not need to be a separate machine. It may be installed on head node, web server or other machine. Full MS SQL server is NOT necessary, MS SQL Server Express Advanced (free) may be used. SQL server is used to store and manage user and interface information. MS Windows Server 2003 and MS SQL Server 2005.